From Huntsville to Dothan and everywhere in between, TSI is the leading Alabama shipping company. Get exceptional service at affordable rates. We help thousands of families and businesses every year — let us help you. Your time is valuable, why not let us prepare your Alabama shipment for you? Here's how it works. When you choose our White Glove service, professional movers prepare your items for you. 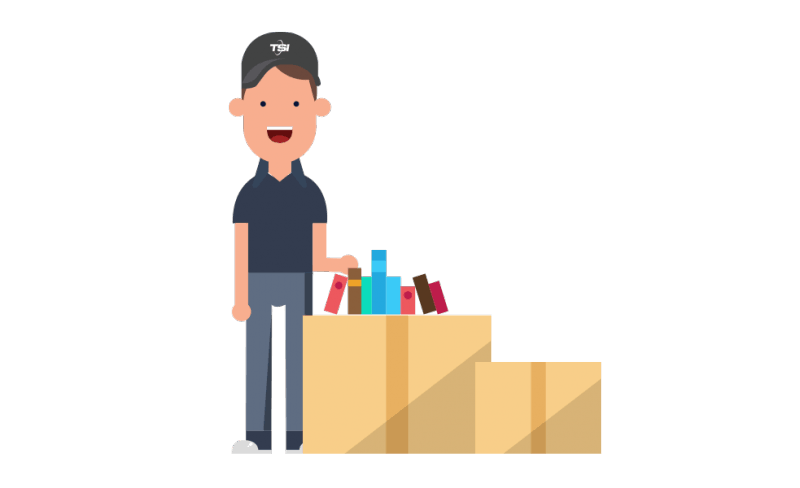 When your goods arrive at their destination, just tell our two-man moving team where you want everything. They’ll unload and deliver inside, so you'll have extra time to relax. Whether you choose Economy or White Glove, shipping to Alabama is simple with TSI. Our professionals will make sure everything is classified and documented correctly. No delays or fines for you. Why TSI is the right Alabama shipping company? Our vast network means you can ship to and from almost anywhere in the US quickly. Birmingham. Tuscaloosa. Montgomery. Wherever you are in the Yellowhammer State, we can help. Our dedicated team members go above and beyond to get you the best price. Shipping to Alabama is easy with TSI by your side. All our carriers go through a strict vetting process and are held to some of the highest standards in the industry. Enjoy damage-free delivery and courteous professionals. TSI has been a leading Alabama shipping company since1989. Our customer service professionals know how to get you the lowest rate for your specific shipment. Your Alabama shipping quote goes through real human review and is double checked for accuracy. Once your shipment is booked, you have the whole TSI team at your disposal. We’ll handle all the paperwork and offer our expert opinions. Without hesitation, use Transit Systems. Discuss your needs and your shipment thoroughly with the knowledgeable staff to provide a smooth and accurate delivery. I work and live in two different states, so I needed to move personal effects, while keeping my home base intact. TSI allowed me to move what I wanted, and charged me by the pound instead of imposing a high mandatory minimum that is imposed by most moving companies. I was able to move all the things I wanted, at a fair price. Priceless! Let the leading Alabama shipping company handle your transport needs. Call us or request a quote online.